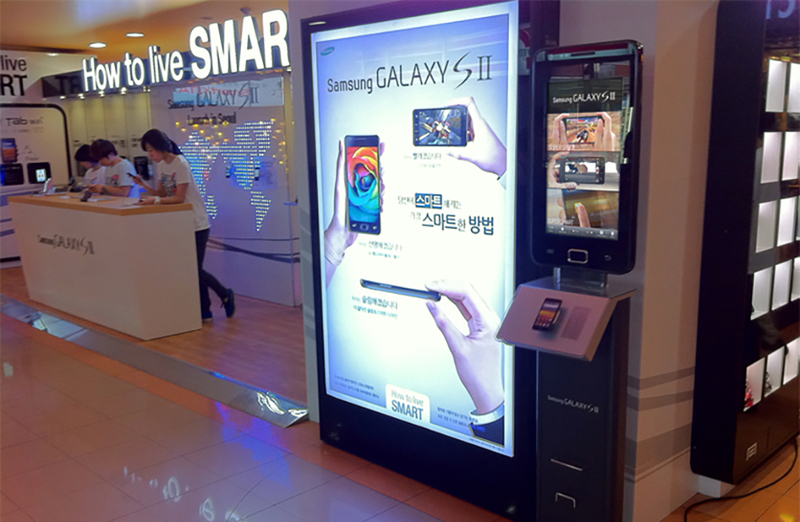 This is Samsung's official digital kiosk for promoting the release of the new Galaxy SII. It emphasizes on informing the user/audience about the phone's new features and strengths. It comes in two different versions. There is an interactive version, which allows the users to experience the features through the touch screen, and there is also a video version, which autoplays the experience. This was a project creating content for an interactive media installation, promoting the new Samsung Electronics smartphone, Galaxy SII. I worked with an engineer and a motion designer. I was the project leader and was in charge of the overall planning, designing graphics and contacting the client. The installations were spread out all over the country, including locations such as the COEX Mall (The largest underground shopping mall in Asia) and D’light (Samsung’s official promotional center in Seoul).